Include a news item on your organization’s blog, homepage, newsletter or e-newsletter. October or early November distribution. Include information on #weGiveCatholic in recognition letters or other donor publications. organization’s page on the #weGiveCatholic website. on that day by going to www.wegivecatholic.org , search for <Name of Organization as registered in weGiveCatholic.org>, then click “Donate Now”. Your donation will go a long way in helping us <insert value proposition>. Mark your calendar, then Give Catholic on Giving Tuesday. 2) Can we count on your support for the #weGiveCatholic challenge on November 27? Plan on rallying your friends and supporting your favorite charity (us!) as part of Northeast Ohio’s Online Day of Catholic Giving. Start now by “Liking” us on Facebook and stay tuned for details: www.facebook.com/YOUR_URL .Follow us on Twitter at www.twitter.com/YOUR_URL . Can we count on your support for the #weGiveCatholic challenge on November 27? Plan on rallying your friends and supporting your favorite charity (us!) 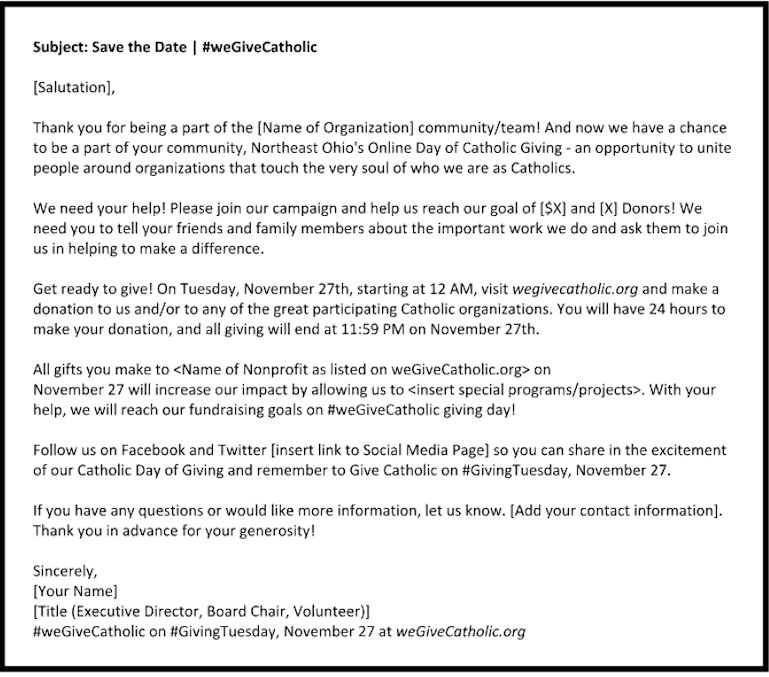 as part of Northeast Ohio’s Online Day of Catholic Giving. Then click on our #weGiveCatholic button to make a donation on November 27. Week of October 15 - Send a save the date email, such as the sample "Save the Date" email shown below. Week of November 12 - Send another email, such as "Ready to Lend a Helping Hand" email shown below. Day of November 27 - Morning: Send a morning email, such as "Today's the Day" email shown below. Day of November 27 - Afternoon: Send an afternoon email, such as "Going Strong" email shown below. Day of November 27 - Dinner Hour: Send a late day email, such as "There's Still Time" email shown below. November 28 - Be sure to send out a thank you email that tells all about your success and the impact that your donors made! There is a direct correlation between emails sent at specific times and and increase in donations! Download all of the templates! Need your donors and volunteers to do something now? Email allows immediate dissemination. No one has time to have things printed, folded, and mailed. Though this falls under online I like to keep it a separate category, as there are so many ways to generate interest in your organization by asking your current volunteers and donors to share information to their social networks. Whether it is a fundraising campaign, special event invitation, or newsletter, using your constituents to maximize your message can only help. Try sending emails on a different day. If you always send the newsletter the first Monday of every month and your open rate is 15% well guess what…it may be time to change things up. Whether you are sending one email message, or multiple messages over a timeframe, strategic marketing is going to be very important. Given that this campaign is geared towards #weGiveCatholic you are going to want to be sure that each message is building upon the last and that they are directed to the appropriate segment of your constituent population. In the days and weeks leading up to #weGiveCatholic it is important to determine how frequently you want to communicate with donors and volunteers. You may have to adjust your schedule based on the feedback you get and you do not want to damage relationships or leave people feeling uninformed. Make sure to stay on top of the following items. Let the importance of your messaging determine the frequency. As you get closer to #weGiveCatholic you will want to up the frequency. Do not make the mistake of bombarding your readers with messaging early on, as it will only decrease the importance of later messaging. Even better, just keep it short. Don't send a novel, just share a highlight. Your constituents want to know how you're using their dollars to support the organization's mission, but as opposed to sending a detailed list share, some highlights along with a nice summary. Thank you in advance for helping make our #weGiveCatholic campaign a HUGE success!